In 1985, The Texas Cyclone at Astroworld (Houston, TX) got its braking system modified. It went from friction brakes to Arrow Dynamics pneumatic pinch brakes. The two PTC trains that ran at the time on the roller coaster had a braking fin retrofitted to one of the under carrier friction plate. In 1987, when the ride gained its infamous “Coffin Cars” from DH Morgan, the fins were designed and manufactured into the trains. The Grizzly at California’s Great America (Santa Clara, CA) used Arrow Dynamic pneumatic brakes and those are still in use. That ride opened in 1986. Interestingly, at one point, an Arrow brake caliper was replaced by a smaller PTC brake. In 2000, Intamin supplied the ride hardware and trains for the Magnus Colossus at Terra Mitica (Benidorm, Spain). Designed by Dennis Starkey and the Stand Company and built by the Roller Coaster Corporation of America, Intamin installed for the first time on a wooden coaster magnetic brakes. Those rare earth permanent magnets are mounted in a regular caliper configuration and work on the eddy-current principle. The main idea is that the braking power is proportional to the speed of the train. This provides a smooth braking motion, but they are unable to completely stop and hold the train. Intamin solution to that was to use large heavy duty drive tires to stop the trains in the pre course braking area and station area in a similar set up to their steel Mega Coaster and Giga Coaster installations. 2000 saw a new player enter the wooden coaster business: Vekoma. That year, as a part of a major project to transform Walibi Flevo (Flevoland, Netherlands) into Six Flags Holland, Vekoma sold 5 new attractions to Six Flags for that park, including a wooden coaster. 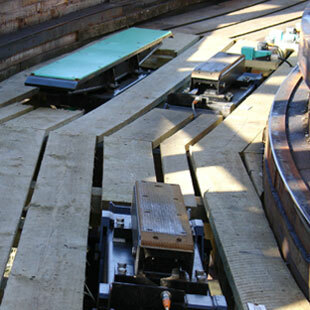 Robin Hood at that park used standard Vekoma pneumatic pinch brakes to slow and stop the trains. It was so successful that was Six Flags ordered another wooden coaster in 2001 for the Walibi Wavre (Wavre, Belgium) transformation into Six Flags Belgium and Tusenfryd near Oslo, Norway also ordered a wooden coaster. 2002 saw Premier Rides third foray into the wooden coaster area and it was at Kings Island (Mason, OH). The Beast was involved in an incident the year before and the park decided to change the whole braking process. The 3 existing PTC trains were modified by Premier to receive brake fins and many parts of the ride rebuilt to remove the skid brakes and install new brake calipers. The innovation here was that Premier was the first to come up with the right metal alloy for the fins that would be react well enough to eddy current brakes and yet be durable enough for standard pneumatic mechanical braking. So, The Beast feature Premier fin brakes in the station, before the transfer section and 2 pre station braking zones. The rest of the ride as well as the speed reduction zone at the end feature strips of eddy current brakes that can easily be removed in the fall season when temperature falls and the ride need more speed to complete the course. 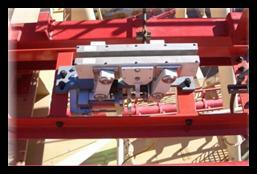 This strip of magnetic brakes is installed in the pre station brake run of the Beast. In 2003, Great Coasters International Inc. (GCII) came up with their own version of the fin brakes. In that case, the calipers are of a different shape and use smaller pads inside. Later on, in 2007, they also started using eddy-current magnetic brakes to trim most of the speed to reduce wear and tear on the brake fins and calipers. This picture show the main section of a GCII fin brake caliper. One of the GCI brake on Gold Striker at California’s Great America (Santa Clara, CA). The Python in Bamboo Forest at Wanda Theme Park in Nanchang, China use both eddy-current magnetic brakes and GCI pneumatic brakes. The magnetic brake is on the left and the pneumatic brake on the right. In May 2004, there was a fire at the Pleasure Beach in Blackpool, UK and it destroyed the station of the Grand National, a 1935 classic wooden roller coaster. Pleasure Beach called in Kumbak, a Dutch engineering firm. They installed a brand new modern ride control system and installed a mixed fin based pneumatic calipers/eddy current braking system on the reformed Grand National. The fins on the new PTC trains were also changed by Kumbak to work with their equipment. The project was completed quickly and the ride reopened in October of the same year. Kumbak was formed in 2001 after Vekoma underwent financial hardships that year. Some engineers branched off and formed an engineering firm that specializes in ride upgrades and refurbishment. In 2007, Port Aventura called in Kumbak to do an upgrade to the ride control system, braking system and change the trains on Stampida. Stampida is a 1997 Custom Coasters International (CCI) racing/dueling wooden roller coaster that was experiencing some heavy wear and tear issues on the trains. Kumbak came in in 2007, designed and built four new trains and installed at the same time new brakes. It is the same combination of the pneumatic calipers/eddy current brakes that were installed 3 years earlier on Grand National. Tomahawk, the sister junior ride to the Stampida also had the same control and braking upgrades. Kumbak worked on another project in 2010. Bakken (Klampenborg, Danemark) decided to upgrade its classic scenic railway, the Rutschebanen. It opened in 1932 and still had the original trains with the brakeman riding on board. Kumbak came in and combined a Rockwell Automation Allen-Bradley Guardlogix safety controller with pneumatic friction brakes and magnetic brakes. Three new trains were built and thanks to the new braking and control system, no brakeman is necessary and the ride now is TUV approved. The green plate in front of the train is one of the magnetic brake used on the ride. Velocity Magnetics came onto the scene in the early 2000’s. They are today a large supplier of magnetic brakes to many manufacturers, such as Rocky Mountain Construction. 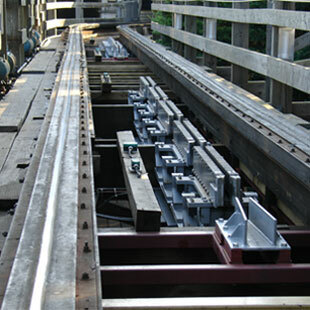 RMC use Dyna-Brake magnetic brakes on their installations, such as Outlaw Run at Silver Dollar City (Branson, MO). 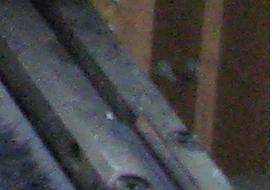 The other brakes used on Outlaw Run are similar in shape and function to the Arrow pneumatic squeeze brakes. One major innovation for Velocity Magnetics is magnetic friction brakes, first introduced in 2012 on the Comet at Waldameer Park (Erie, PA). For this project, the park removed approximately 175 feet of track from the station and brake run. 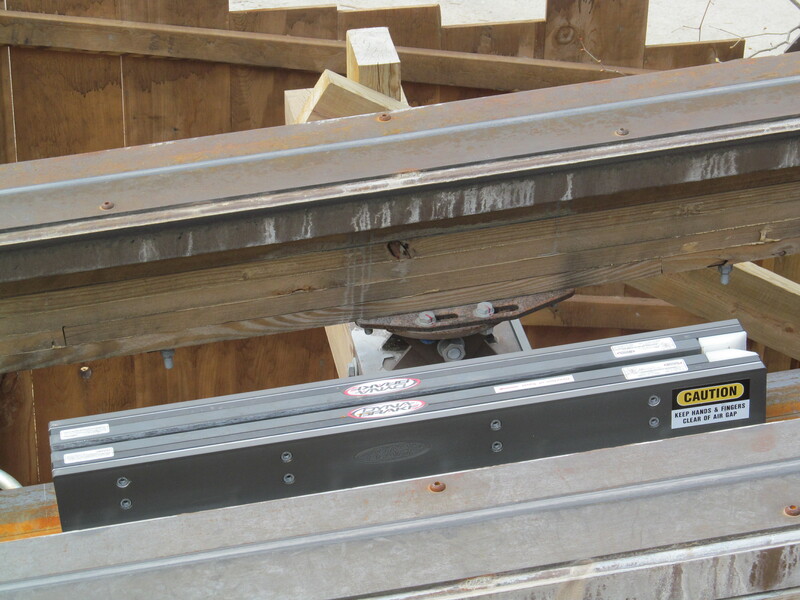 Velocity Magnetics then manufactured pre molded steel track that was bolted to the existing structure. The wooden running boards were bolted to the top of the running steel. Meanwhile, one car of the two PTC junior trains was sent to Velocity for modifications. The pads under the car were replaced by a new alloy that is both resistant and compatible with the rare earth magnets that will slow down the train in the 3 fixed magnetic brake sections. Then, 5 pneumatic friction brake sections will slow down the train and hold it. The load and unload has two more sections that are independently controlled.